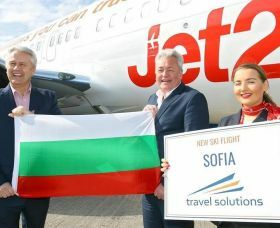 Northern Ireland’s leading ski tour operator, Travel Solutions, have launched a new winter ski charter programme from Belfast International to Sofia, doubling the number of flights to Bulgaria during the winter ski season. The new flight will supplement the already popular Belfast International to Plovdiv charter programme, almost doubling the numbers of holidays available to the Northern Ireland skier. Recently voted “Best Ski Operator in Norther Ireland”, Travel Solutions will fly customers with award winning Jet2.com. In making the announcement, Peter McMinn (Travel Solution) said, “Each year we strive to enhance our customers’ holiday experience and with a choice of Plovdiv or Sofia, shorter transfer times to Borovets and Bansko, and great value prices starting from £549 per person, we know the new ski season will be a great success”. Travel Solutions operate weekly flights to Plovdiv and Sofia from the 22nd December 2019 to 22nd March 2020 with direct non-stop flights from Belfast International Airport.